Apple brings good news to public that the long anticipated iPad 2 will be officially available by March 11th. In conjunction with that, for those that are waiting for good solution to extend their media contents (from iOS device) to be displayed on large LCD screen, the Cupertino-based company also announced the availability of a new Digital AV HDMI adapter that can mirror or clone HD (High Definition) media to external display from iPad 2 directly. Good thing is, the mini Digital AV HDMI adapter will also be backward compatible with current iOS devices such as first generation iPad or iPhone 4. 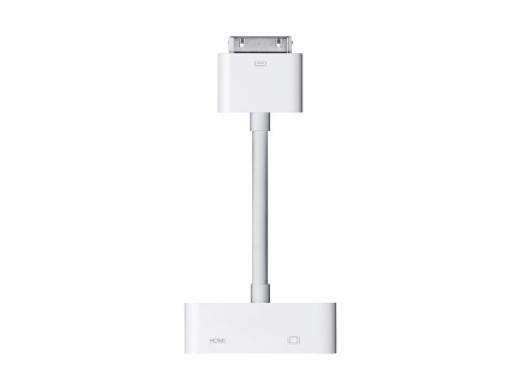 Technically, the adapter is designed to connect to current 30-pin proprietary connector on iOS device and on the other end, it will be fitted well as an adapter to the famous HDMI interface, that has been widely adopted in consumer electronics products. To make it more useful, there is an additional connector that can plug into Apple USB cable so that users can synchronize to PC while streaming the media contents to external LCD screen. Even though this is mainly targeted for iPad 2 usage that can output a maximum full HD 1080p resolution on HDTV, but there is no reason to restrict it to be used on earlier generation products such as first generation iPad or iPhone 4 (with only drawback of maximum resolution capped at 720p) which is great for photos sharing, foils presentation and etc. Priced at $39, the Digital HDMI AV Adapter will be available on March 11th, when the iPad 2 is scheduled to be launched.